2 New Residents for Old Stones! What a great afternoon! An intrepid crew came out to the Calvinist Cemetery this afternoon and probed for missing stones. Working form a list done in the late 1800’s it had become apparent that we have a dozen or so folks buried in the cemetery that we didn’t have markers for. 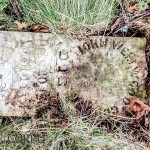 Sometimes in the past markers have been stolen, but often they just fall over and get covered over, since this cemetery was last active in the 1870’s and was the last to be restored in 2004, it wasn’t surprising that some markers might have been just “lost” to us by toppling. 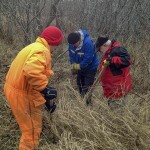 Our team probed the likely areas and discovered two new residents! 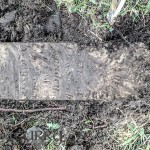 The write-up is now adjusted for the family of Sarah Goudey, who was a known resident, but now we have the markers for her husband John Wellwood Goudey and their daughter Sarah Adelaide Goudey. 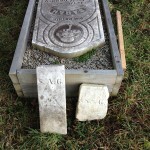 It turns out John and his daughter Sarah died almost exactly a month apart in 1865 from typhoid fever, and both markers were found next to Sarah’s existing marker. 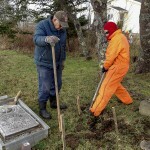 The photos below show the action as we made the discovery, and the write-up for the family is on Old Stones’ website. Thanks to all those who came out and helped – and now we get to add information to our database. This entry was posted in Uncategorized by BillCurry. Bookmark the permalink.